Bridget Fonda at the California premiere of "The Nightmare Before Christmas 3D". Bridget Fonda and her husband Danny Elfman, Gary Winick at the Los Angeles premiere of "Charlotte's Web". Bridget Fonda and her father Peter Fonda at the ceremony honoring him with a star on the Hollywood Walk of Fame. Bridget Fonda at the ceremony honoring her father, actor Peter Fonda with a star on the Hollywood Walk of Fame. Bridget Fonda and her husband Danny Elfman at the Los Angeles premiere of "Charlotte's Web". Bridget Fonda and Danny Elfman at the Hollywood premiere of "Meet The Robinsons". Bridget Fonda at the Hollywood premiere of "Meet The Robinsons". Bridget Fonda and her husband Danny Elfman, Brad Grey at the Los Angeles premiere of "Charlotte's Web". Bridget Fonda and her husband Danny Elfman at the California world premiere of "The Hulk". Bridget Fonda at the California world premiere of "The Hulk". Bridget Fonda at the California world premiere of "Seabiscuit". Bridget Fonda and her father Peter and mother Becky Fonda at the ceremony honoring him with a star on the Hollywood Walk of Fame. 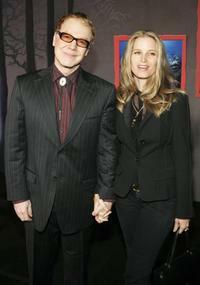 Bridget Fonda and her husband Danny Elfman at the California world premiere of "Seabiscuit".